Same Breastcollar as above tooled to match your saddle!! The matching breastcollar HAL-1161 Brown Show Breastcollar is sold separately. Matching white leather breastcollar for the White Cross Face Bridle found on the Draft Costume-Medieval page. The white leather with chestnut edges has silver conchos and hardware. Center between legs to cinch - 29"-31"
Center to side front of saddle - 32"-34"
Black Leather Breastcollar with Red and White Rawhide Trim. Basketweave tooling and silver buckles. 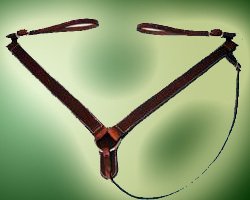 The matching bridle is Hal-2012 Black Western Bridle with Red and White Trim. 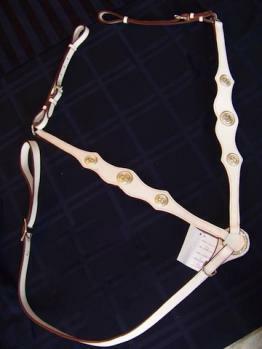 Center between legs to cinch - 28"-30"
Center to side front of saddle - 31"-33"